This guest post is from Judith Hannan, author of the memoir Motherhood Exagerated which chronicled her experience of her daughter’s cancer treatment and transition into survival. Hannan’s latest book, The Write Prescription is a hands-on guide to writing about illness. I look forward to reading the book (and reviewing it here, soon) and using some of the writing prompts with my Monday Writers Group in Albuquerque. “If you tell yourself like a story, it doesn’t seem so bad.” I wish I were the author of these words but they come from Jeanette Winterson’s novel Lighthousekeeping. They express an essential truth. In 2000, when my younger daughter, then eight, was diagnosed with cancer, I wrote in my journal with unusual regularity. And after her treatment and through the years of her survival I wrote and wrote until I came to understand those years, could put them in a context, and see how I had been transformed. The result was the publication of a memoir, Motherhood Exaggerated, because the other truth I know is that our stories, once written, must be heard by others. When I write, I feel as if I am standing next to myself. This slight remove, which I can never achieve when I am speaking my story, allows me to go deeper into my feelings. Even the hardest emotions are easier for me to face. In my writing I can use metaphor or personification, I can speak from the third-person perspective, I can set small scenes rather than taking on the whole arc. I set the pace; I can approach on tip-toe, with two steps foreard and one back, in a zig-zag or a spiral. Several years ago, my father began a not so gradual decline from Alzheimer’s disease. My notebooks were never far from my side. 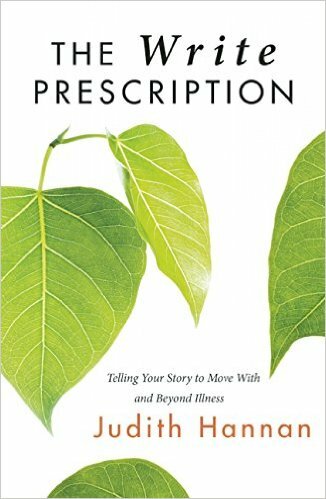 I had what I thought was an atypical response to hospice which I wrote about in my book, The Write Prescription: Telling Your Story to Move With and Beyond Illness. My goal is to help birth more stories illness, survival, death, grief, and survival. What follows is an excerpt which emerged from witnessing my father’s final days. Hospice has become the holy grail of the “good death,” either at home or at a hospice house. I had never experienced this form of palliative, non-interventionist care until my father was admitted to hospice when his Alzheimer’s disease reached its end stage. He entered disoriented and agitated. But visitors would come and say at least he was at peace now. Peace? In his bed my father bicycled his legs, flailed his arms, tried to rise, talked to himself or invisible others, and made expressions that ranged from a smile to pain to terror. Dignity? We discussed funeral plans over his bed, having been told he couldn’t understand us, as if he were the forgotten child who hears all the fights and secrets in the family. What people meant was that the setting was peaceful. The hospice workers cared for my father with the mindfulness of Zen Buddhist monks. Even when they knew he was going to die within an hour or maybe two they bathed him and trimmed his mustache and put soothing balm on his dry lips. They were like external dignity pumps. I am grateful for hospice. It gave my father the best possible death. But it is a mask for the violence that occurs at life’s end. When the mask came off I found my grieving complicated. I could not say that what happened was good. Rather than wrestling with tangled notions of dignity, it is more accurate to say that what we are seeking at the end of life, or at any stage of illness, is compassion. Write about your experiences with dying—whether you were at a loved one’s bedside or a distance away. How did what happened support or contradict preconceived notions on how you hoped that person would die? Set the scene. Where were you? Who else was there? What sounds did you hear? What did people say? Was it calm or hectic? Could you describe it as a good death? Respond to Dr. Nuland’s belief that we lose dignity when our bodies fail. What expectations, fears, anxieties arise for you when you think about your own death. What is your belief about what happens when you die? Have you written a living will? If not, write one now. Don’t just include advance directives regarding lifesaving measures, write about who you would want to be present, where you would want to be. My mother planned her funeral—the speakers, the music, where her ashes were to be buried. If you want to, and think it would be helpful to you or your family, write down a guide for your own funeral. If you need help having these difficult conversations, I recommend visiting www.theconversationproject.org. This entry was posted in creative writing, grief, Mothers. Bookmark the permalink.